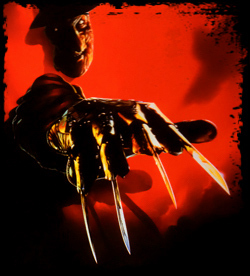 After killing all of Springwood’s children but one, Freddy Krueger seeks to escape the town’s borders and continue his murder spree of innocents in Freddy’s Dead: The Final Nightmare. 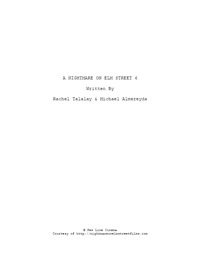 Two scripts are available here: an early draft by Rachel Talalay and Michael Almereyda, and the shooting draft by Rachel Talalay and Michael De Luca. 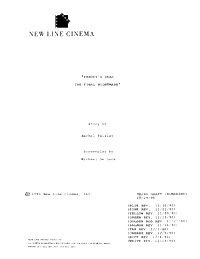 The early draft appeared on the DVD released in 2000. Rachel Talalay and Michael De Luca’s draft is a website exclusive! It contains alternate scenes, extended dialogue, director notes, and more. Both scripts are in PDF format. A Nightmare on Elm Street 5’s disappointing box office results convinced New Line Cinema that maybe Freddy Krueger had run his course and it was time to put an end to the (in)famous villain. A sad-faced little GIRL pushes her face up from the seat in front of him and turns to face John. Brown hair, red-ribbon pigtails. She startles him. He’s gonna make you help him… because you’re the last. John stares at her. He smiles weakly. Then signals the stewardess again. Listen, I really need to change this seat. Maggie’s visibly unnerved by this revelation. Why are they dreaming about the same thing? The article, do you remember where you got it? No… it was about some woman, right? “Loretta Krueger.” She disappeared in ’67. They never found her. John thinks, then makes an “I don’t know” gesture, frustrated. Maggie comes downstairs and starts looking for Spencer and Carlos. A RUMBLING of BRICKS attracts Maggie’s attention to a walled up section of the basement. Cemented over, the cement has started to crack and the entire wall seems loose. She walks over to it. She HEARS a RUMBLING, and a SCRAPING from behind the wall. Good thinking, the kid’s deaf. She listens. No answer. Just SCRAPING. She sees a piece of twine on the floor, embedded in the cement. Maggie pulls it, and pulls it, and pulls it. The twine moves up until it’s ripped an outline of a door in the cement. The cement falls away, revealing a hidden room. She peers inside. Tacked to the walls are dozens of articles recounting Freddy’s infamous rampage. There are several, early models of Freddy’s glove littered about. Freddy grips his head in pain. We MOVE IN towards Freddy’s face as he SCREAMS. Maggie finds herself in a surreal, almost industrial hallway with several metal doors lining its walls and one at the far end. There are pipes and conduits hanging down, and CRACKLING arcs of electricity SHOOT between the pipes and the metal doors. Maggie’s basically stuck in Freddy’s version of a synapse in his brain. Maggie ducks the dangerous electricity, unable to put her hands on any of the doors. Each time she goes for one, the electricity gets there first and ZAP! She ducks the electricity but it backs her towards the door at the end of the hall. She’s trapped there, with the advancing “lightning” coming closer and closer.